Cairngorm Mountain Rescue Team during rescue operations. Coastguard chiefs are to meet mountain rescuers who condemned the “casual disregard” for their safety over the use of helicopters in search operations. The move announced by the Maritime and Coastguard Agency (MCA) yesterday was welcomed by the rescue teams who say they have been overwhelmed by the response after speaking out about their concerns, claiming lives are being put at risk. Members of Glencoe, Cairngorm, Lochaber and Tayside teams claim there is an “unwillingness” by agencies to help recover dead bodies from the hills and to help get crew and their gear safely back to base after an operation. The teams – known collectively as iSMR (independent Scottish Mountain Rescue – issued a statement on Friday about the impact of a new coastguard contract was having, leading to “a reluctance” by helicopter operators to assist during missions. Police Scotland has also stepped in to row. Superintendent Carol McGuire said: “Police Scotland is the co-ordinating authority for any land-based search and rescue incident in Scotland and can only do this due to the ongoing support from all mountain rescue teams who do a fantastic job, for which we are grateful. He added: “[We] have been overwhelmed and humbled by the level of support that we have received from the public. “We have been further gratified to find that so many others in the world of mountain rescue, and also people with experience in operating and co-ordinating rescue helicopters, have been prepared to lend their support to our concerns. “We have now received a response from Police Scotland that shows attempts are starting to be made to address the concerns we have had for some time. Scotland’s busiest mountain rescuers spoke out for the first time on Friday over fears for their safety over the use of helicopters in missions, claiming they are being seen as “expandable”. The teams – Glenoce, Lochaber, Cairngorm and Tayside – have had concerns since a £1.6billion contract for the provision of the UK’s search and rescue helicopters was awarded to private operator Bristow Helicopters in 2013. The move came after the Government decided in 2011 that civilian=-only crews would take over the role from the military and the revamp was introduced in 2015. 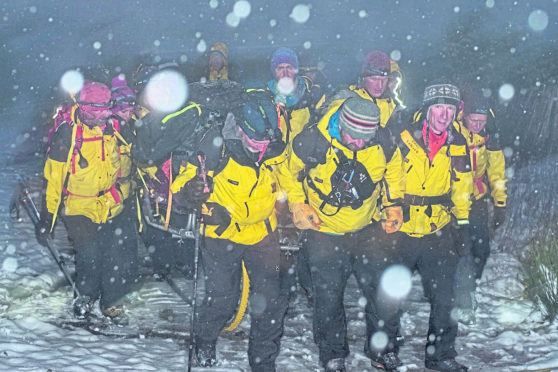 The teams – known collectively as iSMR (independent Scottish Mountain Rescue) – made a public statement after discussions with the Maritime Coastguard Agency failed to resolve their issues. They claim they are repeatedly denied help in retrieving dead bodies from the hills because they are no longer “persons in distress”. ISMR also claim there is an increasing unwillingness to help rescue teams and their safety gear back to base after an operation. They say there have been occasions when rescue team members have been at risk, but helicopter crews have been instructed not to assist. The MCA said: “We value and appreciate the work of all volunteers in search and rescue. “We know how much what they do matters. We also care greatly for our helicopter crews, who often put themselves at great risk to rescue others. “We do support the recovery of those who have died whenever possible – and in circumstances where an MR Team are on a rescue and where there is a clear risk to the MR Team, the helicopter can be asked to remove them from the area to a place of safety.